Investors spend a lot of time looking at historical data series and market relationships but very little time studying how investors allocate their capital. Investor preferences and needs can have huge ramifications on the markets. In this piece I wrote for Bloomberg I look at how investor preferences for stocks have changed over the years along with some potential implications. A combination of a rising stock market and low interest rates has increased investor allocations to equities sharply in recent years. 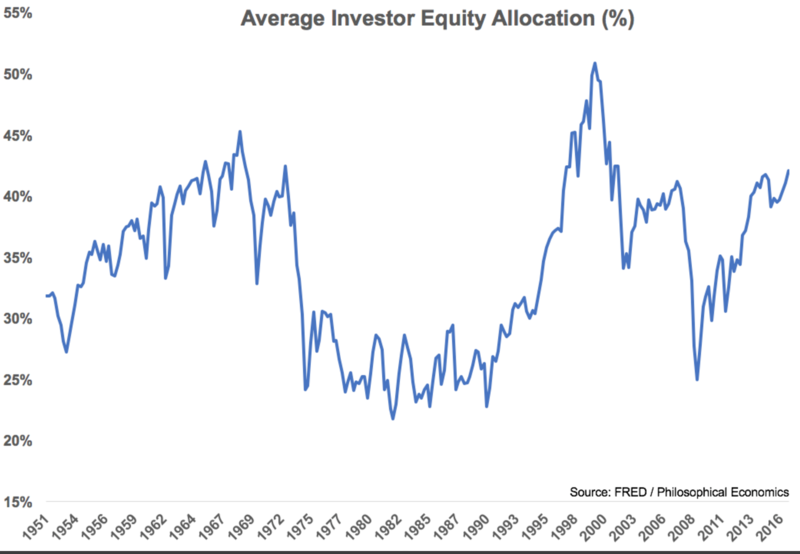 The average investor allocation to equities is now more than 40 percent, which is higher than it was at the latest peak, in 2007. There have only been two times since World War II that allocations to stocks have been higher — after the go-go years of the 1960s and at the height of the dot-com bubble in the late 1990s. From the peak in early 2000 to the trough in early 2009, allocations to stocks were cut in half. Much of this had to do with two market crashes in which stocks were chopped in half. The sharp rise since 2009 also has a lot to do with the rebound since that point, but investors looking for returns have few other places to turn other than the stock market because bond yields are so low these days. Previous high levels in equity allocations have preceded brutal bear markets. Coupled with above-average valuations, many see this metric as a reason to be cautious on stocks in the future. Although it makes sense for investors to temper their expectations for future returns after an extended period of above-average performance, there also needs to be some context attached to current investor asset allocation preferences. The structure of the stock market has changed drastically over the years. 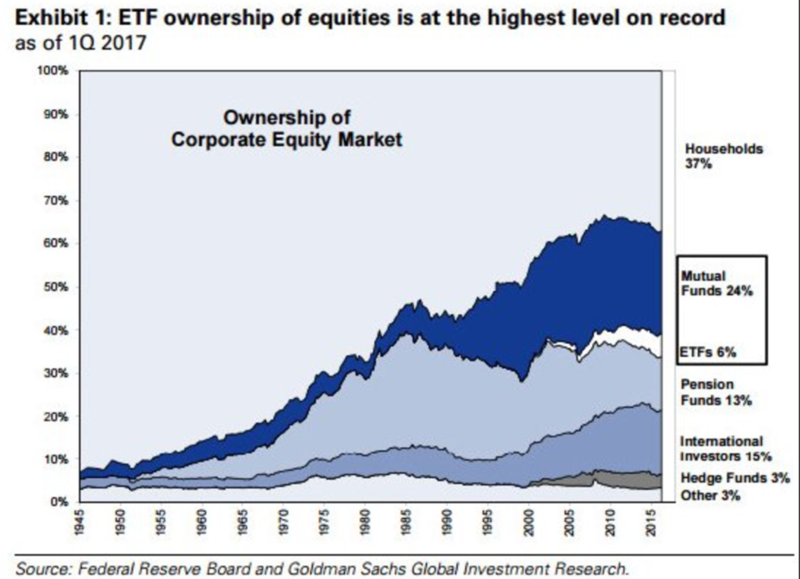 While households used to have a stronghold on stock ownership, professional investors now hold sway, as you can see in the following chart from Goldman Sachs. Although there are concerns about the impact of exchange-traded funds on the markets they still account for a relatively small share of equity ownership. Hedge funds have an even smaller market share. 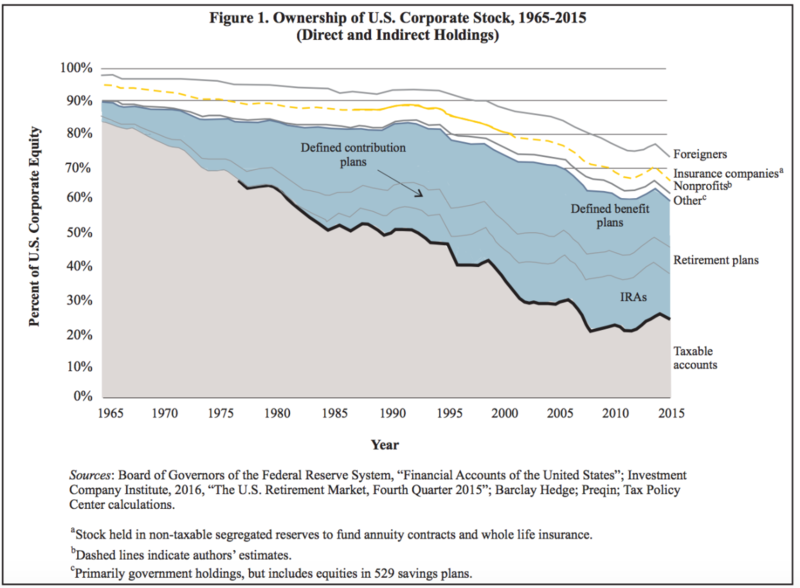 Households and mutual funds dominate, but the market ownership structure is much more diversified than it was. This diversification has given investors many different avenues to access the stock market. 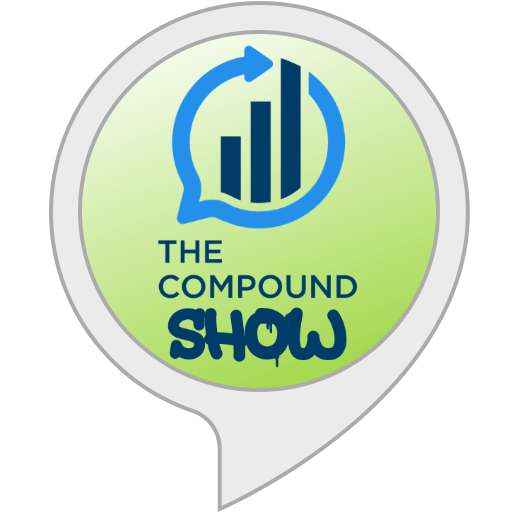 In the past, investors were beholden to brokers to suggest securities on their behalf, but the advent of mutual funds, ETFs, target-date funds and financial advisers have all changed the investment landscape and the way investors allocate their assets. 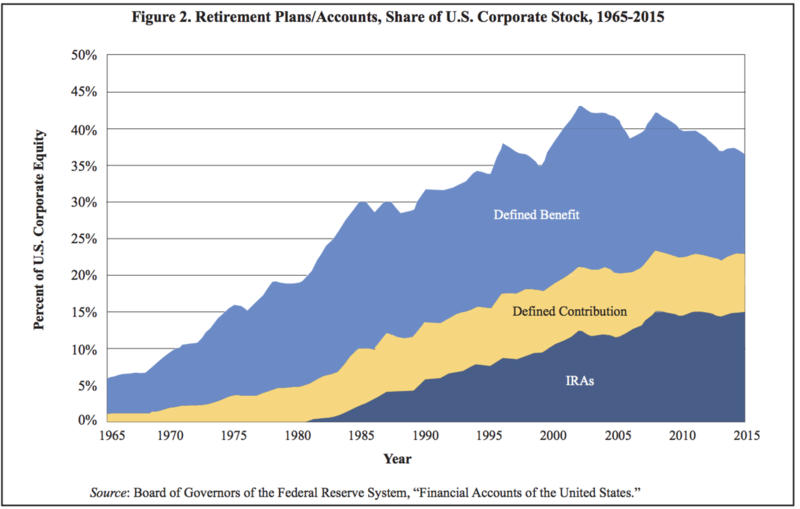 Workplace retirement plans and IRAs now control just shy of 40 percent of the stock market. The increase in tax-deferred accounts gives investors more options within their asset allocation. 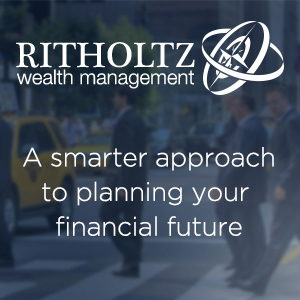 The ability to place tax-efficient assets (low-turnover stock funds) into taxable accounts and tax inefficient assets (such as high-turnover funds, bonds or REITs) into tax-deferred accounts is a huge benefit. Investors can now diversify globally into thousands of different securities using just a handful of funds, for a fraction of the cost of the fees levied in the past. Asset allocation can have a much larger impact on a portfolio’s performance than security selection. The fact that investors are moving away from stock-picking into more diversified strategies is a net positive. The problem is much of this advantage will be lost as investors continually change their allocations through the use of high-turnover ETFs. 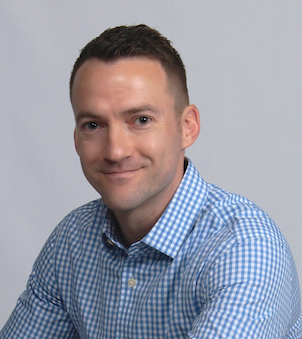 The continued growth of defined-contribution plans will mean a steady stream of periodic retirement contributions into vehicles such as target-date funds, which are automatically allocated on the investor’s behalf. Investors often like to look at the financial markets on an absolute basis, as if these exist in a vacuum. The problem with this line of thinking is that markets are constantly changing and evolving. And they must allocate their money in some combination of stocks, bonds, cash or hard assets. 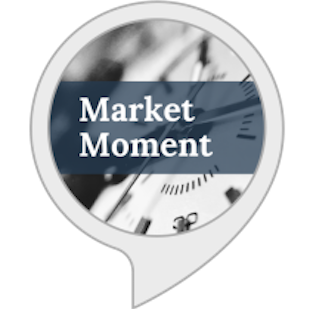 How that money is dispensed can have a lot to do with where markets will trade, what their valuations are and the length of various cycles. There are sure to be unintended consequences from many of these advances in the investment landscape. No one has yet to create an investment fund or product that can prevent investors from panicking or becoming greedy. But you can’t discount the impact changes in allocation preferences and investment products and services will have on the markets.